LED pole lights provide an opportunity for businesses, industrial buildings, and other larger outdoor venues to have access to a high-quality source of light that’s energy efficient. 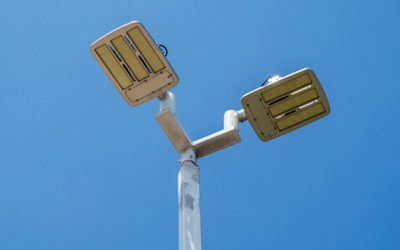 Pole lights are the most common option for outdoor lighting of parking lots, walkways, neighborhoods, and building grounds. That is because this type of fixture creates a large amount of illumination through a beam, which the user can direct in a specific area. Before buying LED pole lights, buyers need to consider a few key factors. Commercial, residential, or industrial uses are acceptable options for LED pole lights, depending on the specific model selected. • Power: Choosing the right LED pole lights means carefully considering needs for illumination. The larger the space is, the more wattage is necessary. Lumens also need to be compared based on the area. • Dimming: The ability of the LED lights to dim can be important in various areas including in residential neighborhoods. • Durability: Look for the amount of shock resistance and overly durability the lights offer. In high-wind or high-impact areas, durability is important. • Life expectancy: How long will the light last? This plays a big role in overall costs especially over the long term for hard-to-reach areas. • Color rendering: High color rendering may be best when you hope to create a more natural appearance and color. Lower levels of color rendering are acceptable for security areas, access areas, or less important areas for visual appearance. • Efficiency: Not all brands and types of lighting are the same. Look at specifics for the product to learn just how efficient it is. Comparing all of your options is important. Finding the right balance isn’t just about costs but quality of the product and long-term options. LED lighting is ideal because of its longer life expectancy, but not all products are the same. Depending on where you plan to place the pole lighting, you may need a higher quality product that lasts longer. Also consider options for hiding the bulb for a more aesthetic appearance. For example, up lighting and down lighting can help as can frosted glass. This helps to make high output lights a bit softer. Most importantly, don’t make the decision of what to purchase in LED pole lighting without first taking into consideration the area and your specific needs for it. By working closely with a skilled electrician, it is possible to find the best possible outcome for your situation. At Bryan Electric, Inc., we can help you match the best LED pole lighting with your space’s unique needs. Request a quote or service to learn more about what your options really are.